Gift Ideas for His "Man Cave"
Football season is upon us once again! And you know what that means…. when you’re man is “MIA”, you can most likely find him in his man cave watching the game. 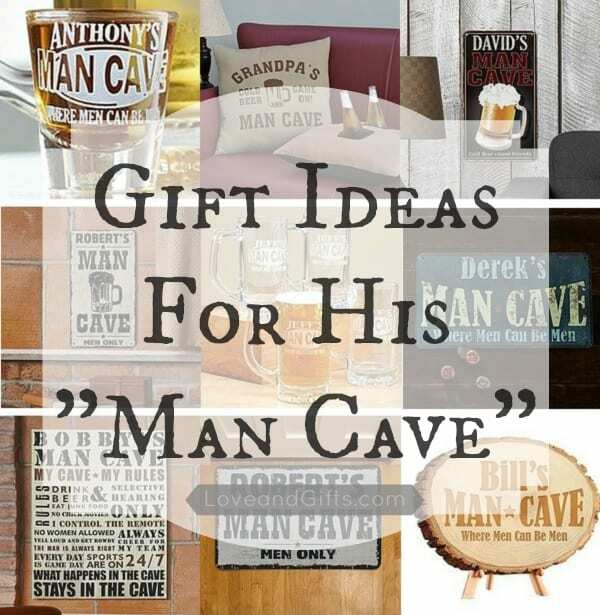 If this sounds like your husband or boyfriend, you may want to consider gifting him with something to deck out his man cave! Don’t know where to start? How about one of these brilliant gift ideas that are personalized just for him! Everyone will know exactly whose man cave their walking in to with one of these doormats displayed by the door. These tough duty Man Cave Doormats come personalized with his name printed on them and are super easy to clean. Perfect for your manly man! Other fitting doormat options are this Man Cave Men Only Doormat or the Man Cave Wood Background Doormat . Your guy will love showing off these rustic and manly personalized signs to his buddies! The Man Cave Cold Beer Metal Sign has the tagline “Cold Beer, Good Friends” while this Man Cave Rustic Metal Sign features the saying “Where Men Can Be Men” and the Man Cave Men Only Metal Sign says just that: “Men Only”. Pick one to fit your guy’s personality! Be sure everyone that steps in to your man’s “man cave” knows the rules of his domain with a personalized Man Cave Rules Canvas or this unique Pine Wood Log Sign ! The Man Cave Beer Coozie Pillow is a decorative accent no man’s man cave should be without! The front is personalized with his name and the back has 2 insulated pockets for his chilled drink and his remote close. If you’re guy enjoys kicking back with a cold brew while watching his favorite sports team in his man cave, he definitely needs some drinking accessories for him and his friends. These Man Cave Shot Glasses and Man Cave Mugs sure do fit the bill! Man Cave Snack Jar warning all not to touch his snacks! Your rustic man also needs some coasters for his man cave to prevent ugly water marks. Check out this Man Cave Coaster Set or the Man Cave Men Only Coasters which both come with a cork backing to prevent slipping as well. Does your guy often have friends over to watch sports with him in his man cave? If so, you might want to consider a gift a pitcher or a beverage tub to share with his dudes! The Man Cave Pitcher and this Man Cave Men Only Pitcher are great unique gift ideas for your husband or boyfriend and come personalized with his named etched on the side. If your guy doesn’t have a tap in his man cave to fill up a pitcher, a personalized beverage tub is a great gift idea! Check out the Man Cave Beverage Tub and the Man Cave Men Only Beverage Tub which are both stylish ways for him to store his favorite beverages before the game. Giving your guy some manly gear for his man cave shows him you care about him and his hobbies and want him to be happy, not just exist to make you happy. These and lots more fabulous personalized gift ideas for your love can be found at Personal Creations for really great prices and free shipping on orders over $49. Click here to get 15% off Personalized Gifts from Personal Creations!